Anyone that knows me knows that I really love food. When I’m eating breakfast I’m certain that it’s my favourite meal of the day. Whether it’s hot or cold, eggy or cereal, I do so love breaking my fast…but then, along comes my old friend, Lunch. As I’m enjoying my mid-day meal, not necessarily anything extravagant – perhaps a salad or sandwich, I would quite solemnly swear that, indeed, lunch was in fact my favourite meal of the day. As soon as the lunch plates have been cleared then I begin to think about my true love, dinner. I rarely plan in advance, as much as I’d love to be orgamanised, but I really, really enjoy a yummy dinner at the end of a long day…..oh, and I love snacks and dessert, did I mention that? I like food. A lot. A LOT. Seeing as this is the beginning of our relationship, dear reader, I thought it only apt to begin with a spot of breakfast. If you charted our foundling relationship as a day one could say we’re in our metaphorical breakfast, so I’m breaking us in easily with a spot of Bircher Muesli. Fun for the whole family. Now my men hate porridge. The strange phenomenon is that they both like Bircher. 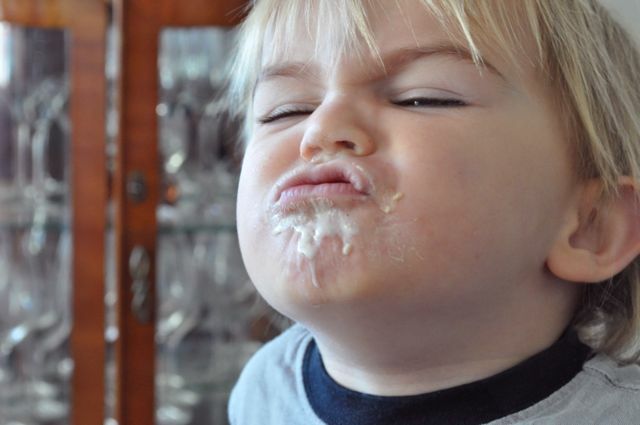 I’m fairly sure Mister H knows Bircher is merely cold porridge but D Man is, as yet, none the wiser. I don’t dig your usual, standard claggy grey bowl of Bircher, I love fancy pants up-town variations that make me feel like I’m consuming a decadent creamy bowl of joy rather than tricked up horse food. 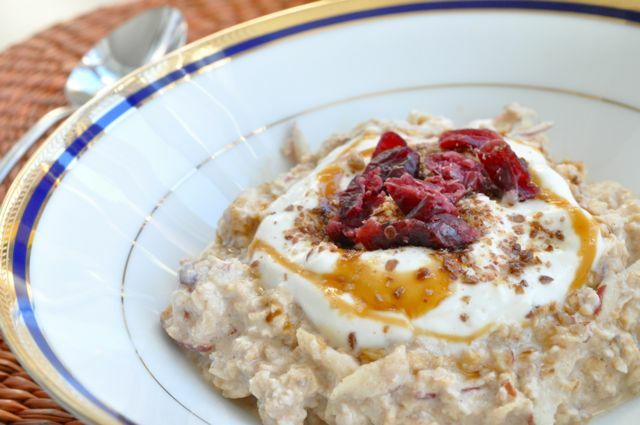 Apple, Cinnamon and Maple Bircher – Holsby Style. 2 tablespoons of real maple syrup – none of that imitation crap, please. The real deal is so much better. a handful of dried cranberries, or fresh berries or other dried fruit of your liking. So easy, gang. Ready? Set? Go! 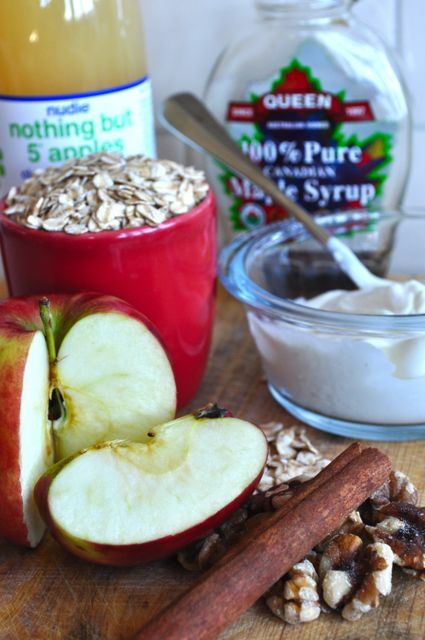 Chuck your oats into a container, and just cover them with the apple juice. Add your yoghurt, cinnamon and grated apple.Stir it like you mean it. Refrigerate overnight. In the morning, serve how much your morning belly wants, dollop on some yoghurt, sprinkle on some LSA and cranberries and drizzle with some maple. Viola! Breakfast of champions and Holbys! Oh D-Man, you are hilarious! very good mate – the apple looks out of a Cezanne painting !! I’d love to say I’ve come a long way since those dark room days but it’s a little bit of a fluke combined with a great camera! hi there, just wanted to say thanks for making my day with your comment! I’m a newbie and an unknown, but it’s nice to see someone other than my mum enjoying my posts!! Have yourself a beautiful day.